Among lovely yarn I have just received from Sandnesgarn (yarn supplier) , I got this lovely yarn in thin Merino wool. Lovely yarn for knitting doll clothes. 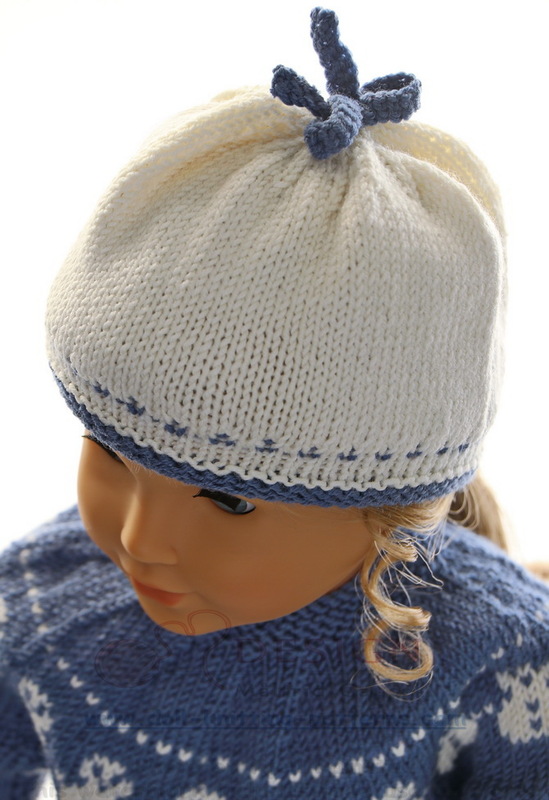 I liked this blue color very much and decided to knit a suit in this color. 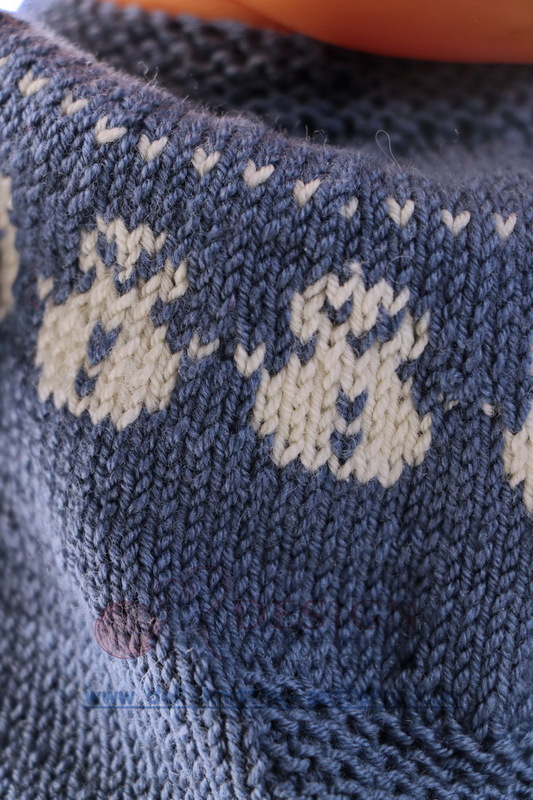 As I had started my knitting, I decided to knit a little pattern round the top with snowmen. As we are close to winter here now I thought, WHY not? The sleeves are knitted in a rib. Both sleeves and legs are nice folded up. Cast on 50 sts and knit 1 row. Continue knitting rib, k1, p1 alternatively across rows until work measures 5 cm before knitting 2 rows st st. On next row do the following increases: K9, increase 1 sts in every second sts until 10 sts are left on row, k10. (= 66 sts on row). Continue knitting 5 rows st st. 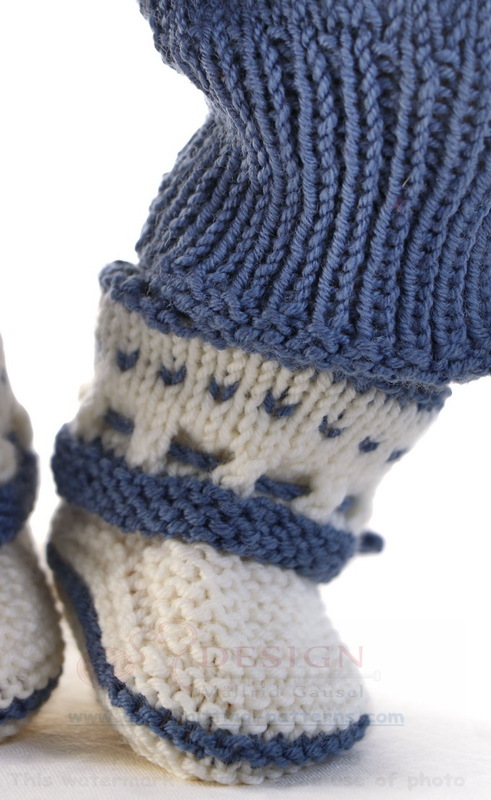 Put work aside and knit the other leg in the same way. Continue knitting both legs onto 4 double pointed ndls or a little circular ndl and continue knitting 2 rows st st over all sts. Place a marker for center front and center back. Always begin row from center back. 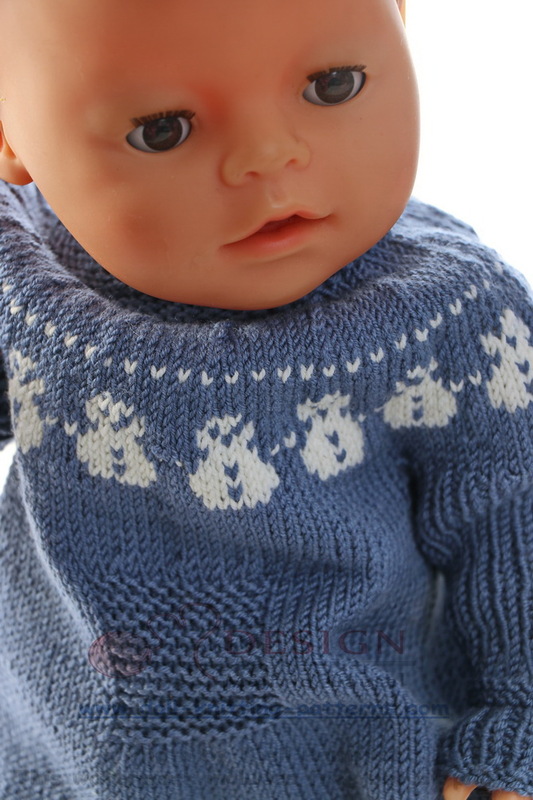 Do the following decreases: K1, k2tog, knit until 3 sts before center front, k2tog TBL, k2, k2tog, knit until 3 sts before center back, k2tog TBL, k1. Repeat these decreases every 3rd row 3 times altog = 120 sts on row. Continue knitting st st. When work measures 13 cm knit the dress back longer like this: K20, turn, p40, turn, k30, turn, p 20 and continue knitting st st over all sts until work measure 14 cm. On next row decrease 10 sts along the center front. 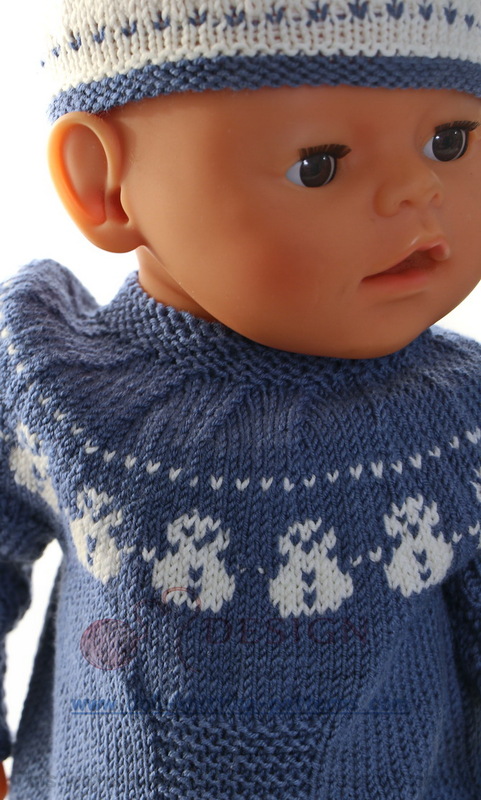 Knit like this: K50, k2tog 10 times, k50. Continue knitting st st and garter sts over these 10 center sts until 10 ridges are knitted on the RS altog. Knit 1 row. On next row increase 1 sts in every of these 10 center sts = 120 sts on row in total. Knit 1 row. 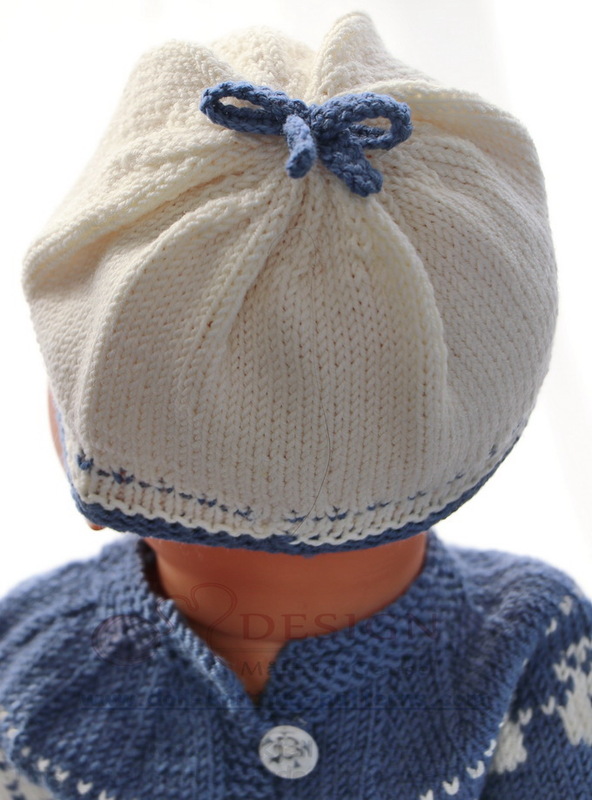 On next row do the following decreases for the armholes: K22, cast off 6 sts, k44, cast off 6 sts, k22. Put work aside and knit the sleeves. Then I knitted a white hat to wear together with this suit. 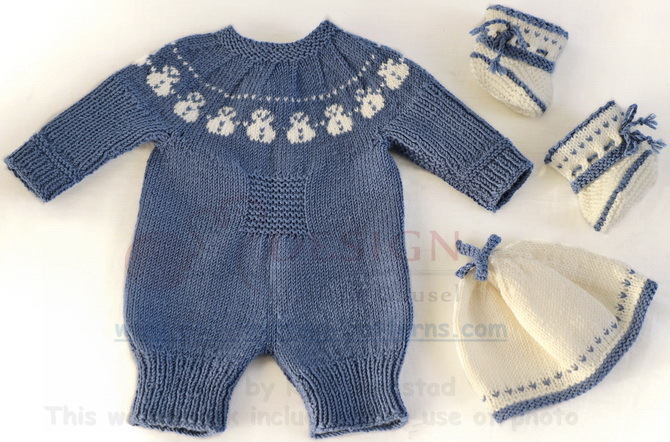 A little blue pattern and blue edges together with a crocheted blue bow at the top was nice as belongings. At last, I knitted these socks/shoes as belongings. More like socks than like shoes I think. They are bended round this blue edges and bound tog with a chord in blue through the eyelets. I think my doll looked different and nice in these new doll clothes. Nice clothes for both dolls I think. Both for Sophia and for Baby born. 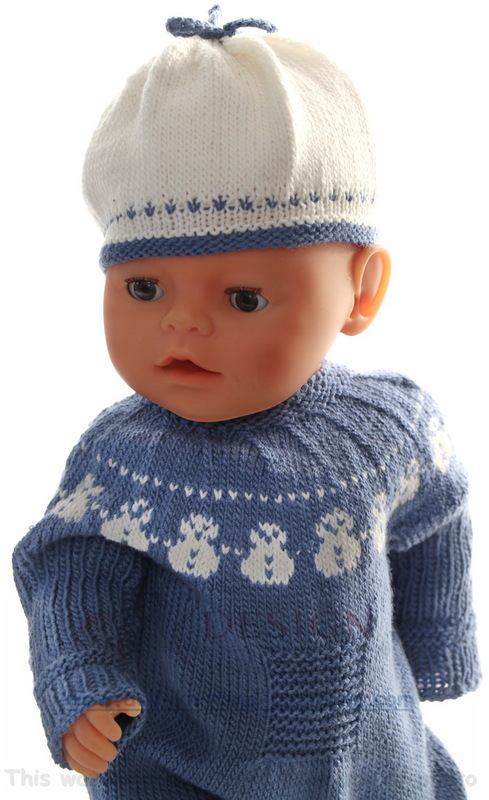 I hope you too will like these clothes too and want to knit them for your doll!